Just in time for fall renos, Rona sent us more loyalty cards. Now you can support Epilepsy Ottawa while you save on purchases at Rona. 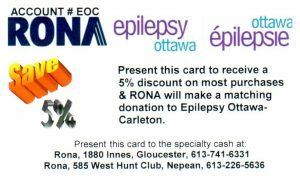 Present your loyalty card on your next trip to Rona and you’ll save 5%, then Rona will send 5% of your purchase price to Epilepsy Ottawa. If you don’t already have a card, call 613-594-9255 or email info@epilepsyottawa.ca to make arrangements to pick up your card at our office in The Bronson Centre.